Love them. LOVE THEM. They have a learning curve, but absolutely cause my frame to function as it's supposed to. 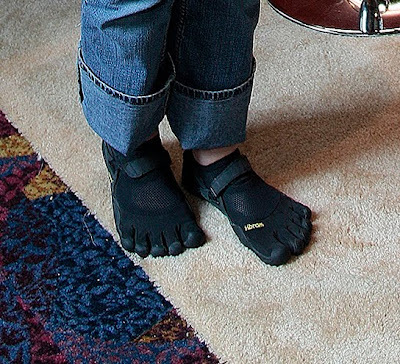 I have not talked specifically about my gecko feet (what boring people call Vibram Fivefingers) because of something else I started ... again. This morning I completed Week Five, Day Two of Couch 2 5K! I have started this program several times before. I could always get to about week three, but then it got very cumbersome AND tiring. A bad combination. I just used my watch or a stopwatch. Always staring down. Always ticking away every single second. BLECGH! And I stopped. Never really got to Week Four, ever. Until now. And I really do put all of my success on ... the last thing I haven't talked about here on my little bloggy blog. So, I have the C25K app on my phone. I pick what music I want on my playlist for each workout. This nice little man stops my music with a "ding" and tells me when to walk or run. He tells me when I'm halfway done, so I can turn around and head back toward home. I just listen to music and try not to pass out. I can do that. I'm really good at trying not to pass out. When I'm done, I can take notes or post it to Twitter (which I did NOT do until I reached Week Five ... knowing I may bail on the program and having every shouting, "LOSER!"). Anywho, these are my two "big purchases" of 2010. The gecko feet are PRICEY. I saved for quite the while for those suckers. The iPhone is PRICEY, and I would have never picked one up had it not been for that beautiful upgrade discounted price from AT&T, and the fact that it was time that we could sneak in an upgrade (and that our other phones were having issues and pretty much beat to a bloody pulp). The C25K app, though, is only $3. Boo-ya! All three ... worth the money, worth the months of research and worth the wait. Ok the feet.. our youth pastor has these and it totally freaked me out the first time I saw him walking arourd the church in them... now I just laugh. He loves them too... I don't have the IPhone but will look in to the mp3s for my IPod nano... hopefully I can make that work. I think I'm gonna start the C25K on Monday. woo hoo! I'll let you know how it goes. Do you run in your gieko's? I love, love, love my Five Fingers!! My husband convinced me to buy some in the spring, and running has never felt so good. Trail running in them makes me feel like a kid. My freaky husband runs 12 or 13 miles at a stretch in them, but I'm happy with 3. They are so worth it! Tell me more about your shoes. I looked at the website, but which style are those. I'm doing c25k also and loving it, but need new shoes, bad. I'm SO intrigued! So, you run in them? More info!!! I noticed your gecko feet at BlogHer. My husband was duly impressed when he saw a photo. (Yes. I took a picture of your feet. Ahem.) We've been looking into them for awhile, too. Glad to hear you love them! They feel like gloves ... on your feet. How cool is that? There are people at a national conference taking sureptitious pics of your tootsies! Who knew you'd have famous footsies? So proud of you doing the couch to 5k thing...no matter what you're wearin' on your feet! Blech. Gloves are for maitre d's and gynecologists. But I must say I am pleased to hear you love your I-phone. I'm a Mac girl form waaaaay (1988!??). They are so elegant--so intuitive. Enjoy. Goo you on the C25K! I just adopted a 4 1/2 year girl with locs. I do not know how to take care of them. Could you guide me? Mama and I are heading to TX in Oct for the conference and one of my goals is to go for a run with Corey (she's been my role model on the running thing). Now I'm hoping to run with you, too! Of course now I need to really get going and stop talking about it--time's a-wasting. So, I checked out the C25K app--there are a couple different ones--which do you use? and can it be used on an iPod shuffle of just the iPhone? Thanks! Mine is actually called C25K. Don't know about working on the shuffle - not familiar with that - sorry! !